Activision wants to make sure that everyone is invited to the Modern Warfare 3 party. Activision has confirmed that as well as gracing the PC, PS3, and Xbox 360, the latest Call of Duty game, Modern Warfare 3, will make its way to the Wii. The Modern Warfare series has an inconsistent history on the Wii, with only one of the two games release so far appearing on the console. Speaking during an investors call, Activision Publishing CEO Eric Hirshberg said that the publisher didn't want to leave any of the Call of Duty community "out of the excitement." That's a bit of a change from previous Modern Warfare games; The first in the series took two years to make it to the Wii, and Modern Warfare 2 has yet to appear. While some might question how much of an audience a game like Modern Warfare 3 will have on the Wii, Activision clearly thinks that it's enough to warrant porting the game over. 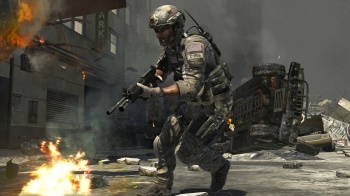 Hirshberg didn't say who was working on the Wii version, although Treyarch has plenty of experience, having handled the port of the first Modern Warfare , as well as releasing all of its Call of Duty games on the console. Call of Duty: Modern Warfare 3 comes out for PC, PS3, Xbox 360, and presumably the Wii, on November 8th.